Today we’re looking at VINEGAR, and all the different science experiments you can do with it! We are taking part in the A-Z of Science Experiments for Kids series and we have been focusing on the letter V – for Vinegar! 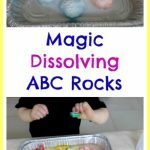 We’ve used vinegar in some of our science experiments before: with Jello powder and baking soda for colorful and scented bubbles, with glitter and baking soda for sparkly eruptions, and with color changing bath tablets for a color mixing activity. We also very recently made a classic play dough volcano!! But let’s back up a little here. WHY do we get these reactions? Well I’m no scientist – so for your convenience here are five different ways of describing why this happens. Simply put, the combination of vinegar (an acetic acid) and baking soda (a bicarbonate) creates carbon dioxide. Call it gas, bubbles, eruptions – whatever you like – it always fascinates and enthralls kids and adults alike! The gas from this reaction can also be used to inflate balloons! What about mixing vinegar with other things? Yes, vinegar can dissolve egg shells! Check out Steve Spangler’s Naked Egg Experiment – and according to Fact Monster – you can also get the eggs to bounce afterwards! This is definitely one for our to-do list! Vinegar can be used to clean dull and dirty copper coins (like pennies) and make them look shiny and new! Here’s how to do it! Want to generate some electricity? Use vinegar! Here’s another seriously cool experiment from Steve Spangler. And you have to check out Little Bins for Little Hands’ whole YEAR of Vinegar and Baking Soda Activities!! 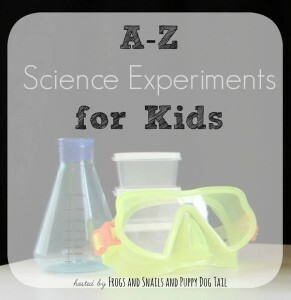 Make sure you check out the rest of the A-Z of Science Experiments series! !